"How far will you go to chase a dream?" 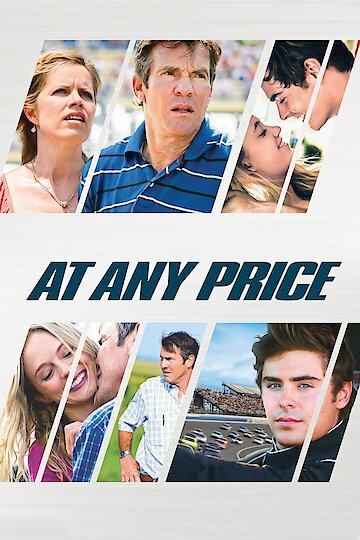 At Any Price is a 2012 film that falls into both the genres of drama and thriller, and it has an approximate running time of about 1 hour and 45 minutes. At Any Price has been rated R, and it was directed by Ramon Bahrani. Also, this movie was written by Hallie Elizabeth Newton and Ramin Bahrani, and it was produced by Mohammed Alturki, Ramon Bahrani, Declan Baldwin, Ron Curtis, Gary Giudice, Pamela Koffler, Andrew Levitas, Justin Nappi, Eric Nyari, Teddy Schwarzman, Summer Shelton, Ben Stillman, Kevin Turen, Christine Vachor, and Brian Young. Furthermore, At Any Price stars many well known actors and actresses such as Dennis Quaid, Kim Dickens, Aaron B. Oduber, Jacob R. Oduber, Zac Efron, Patrick Stevens, Guy Massey, John Hoogenakker, Laura Atwood, Dan Waller, Maika Monroe, Phil Ridarelli, Clancy Brown, Chelcie Ross, Bob Hungerford, Ben Marten, and Red West. This film is mainly focused around a man by the name of Henry Whipple and his son Dean. Henry Whipple has been working in the world of agriculture his entire life and runs his own family farm. A very professional and ambitious man, who wants to pass down his family farm to his son Dean. Henry wants his son Dean to help him with the farm by helping him expand the family's empire. However, Dean has no interest in partaking in his family's empire. Dean is a risk taker, and he dreams of being a professional and the best race car driver around. Things begin to change when one day an investigation of their businesses is discovered. It is a very high-risk investigation and it has suddenly been exposed. This investigation causes both Henry and his son Dean to be put into a unwanted crisis that has put the family's business, livelihood, and possibly their lives in jeopardy. Now they are racing against the clock to save the family’s empire, they will do whatever it takes in order to save this farm and the family's livelihood. At Any Price is currently available to watch and stream, download, buy on demand at Amazon Prime, Amazon, Vudu, Google Play, FandangoNow, iTunes, YouTube VOD online.